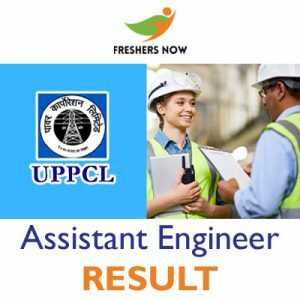 UPPCL Assistant Engineer Result 2019 Is Out…!! Uttar Pradesh Power Corporation Limited (UPPCL) officials had released the UPPCL Assistant Engineer Exam Result 2019 on 5th February 2019. So, candidates who have attempted the उत्तर प्रदेश पावर कॉर्पोरेशन लिमिटेड Computer Based Test can check out the upenergy.in Test Results now on the official portal. Furthermore, we have also attached the direct steps to download and to obtain the Uttar Pradesh AE Result 2019. Check the category wise UPPCL AE Cut Off Marks, the UPPCL AE Merit List 2019 with the help of this page. Moreover, the direct link to check the result is also made available to the end of this page. Candidates who had taken part in the Assistant Engineer Trainee CBT must check the upenergy.in Test Results 2019. If you attempt the test well or not, it is better to check your UPPCL Assistant Engineer Exam Result 2019 to know the status of the selection process. Furthermore, latest update the officials is that they had Released the result on their official portal @ upenergy.in. And then aspirants can access their result by using the Hall Ticket Number as well as the Date Of Birth or the Password. Rather than wasting your time by surfing the internet, you can get all the exact information on this page. Candidates must and should check the UPPCL AE Cut Off Marks 2019 from the current section of this page. The officials of the Uttar Pradesh Power Corporation Limited (UPPCL) also commenced the minimum marks on their portal. Furthermore, candidates can easily find out the category wise UPPCL AE Cut Off Marks 2019 from the previous year analysis. Based on the performance of the candidates, these marks will be announced. Along with the Uttar Pradesh AE Result 2019, the officials will also publish the suitable list on their official portal. And the list contains all the numbers of the candidates who are shortlisted for the next process in the recruitment that is the Interview. So, you need to check the UPPCL AE Merit List 2019 from the webportal. Below is the direct link to check the listed candidates. Furthermore, you can use your hall ticket number to know whether your number is placed in the Qualified List or Not. The successful candidates in written test shall be shortlisted for Personal Interview as per criteria laid down by the organization. The list of successful candidates will be made available at UPPCL website and shortlisted candidates will have to appear for Personal Interview before the Company’s Selection Board. The number of candidates to be called for Personal Interview shall depend upon the number of Trainees to be inducted. Candidates who are worried about the UPPCL Assistant Engineer Result 2019 here and there over the internet can easily get a simple path to check them from the official site. So, make your path with the below mentioned steps. Initially, candidates need to move to the official site of the Uttar Pradesh Power Corporation Limited (UPPCL) @ upenergy.in. In that home page, check the Vacancy/ Results tab which appears on the top middle of this page. Hit on that tab, then you can watch a list of links. From that lists, click on the link that refers to the latest update on the UPPCL Assistant Engineer Exam Result 2019. Enter all your details like the hall ticket number, date of birth, password. Submit the page to get the UPPCL Assistant Engineer Result 2019. Download and also take out the printed copy of it for the further usage. Soon after referring to this page, we hope that all the candidates will check out their UPPCL Assistant Engineer Result 2019. So, to get all such alerts by visiting our site @ FreshersNow.Com on the regular basis.